The gateways has a number of headers that allow connecting LEDs, a reset button, or a temperature sensor. This page provides some details on how to connect these components. The LEDS header has 5 pins. 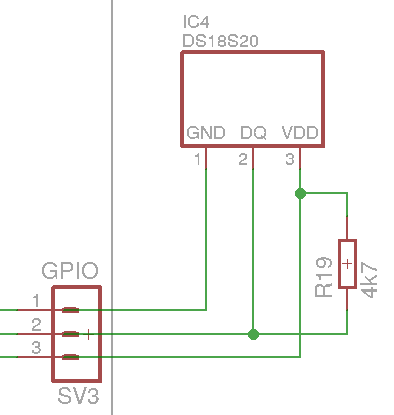 Pin 1 is connected to VCC (5V), the other 4 pins can each drive a LED. 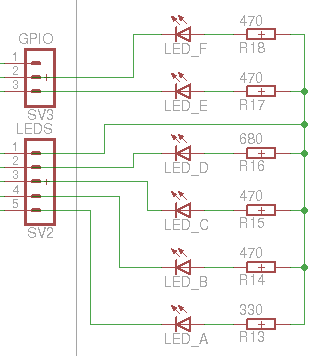 Each LED should be connected via a current-limiting series resistor between VCC and one of the other 4 pins. The anode of the LED should be on the VCC side and the cathode toward the output for the specific LED. The resistor may be placed on either side of the LED, whatever is easiest in the design. You can choose which color LED to use depending on the function you are planning to assign to the LED. I'm using the default assignments (that's how they came to be the defaults), and chose orange for LED A (Flame), green for LED B (Transmit) and LED C (Override), and red for LED D (Maintenance). Different color LEDs have different forward voltage drops and will require different resistors to get the same current to pass through them. On the other hand, some LEDs may appear brighter than others when using the same current. I'm happy with 330 &ohm; for my orange LED, 470 &ohm; for the green ones, and 680 &ohm; for the red one. You may want to get a bunch of different resistor values (between 220 &ohm; and 1 k&ohm; should normally suffice) and experiment with them on the work bench to find the best fit for your LEDs. It can be useful at times to be able to reset the gateway. This is accomplished by pulling the MCLR pin of the PIC low for a short while. A momentary switch can be hooked up to the RST header for this purpose. The RST header has 2 pins: pin 1 (near the R) is connected to ground and pin 2 (near the T) is connected to the MCLR pin of the PIC. Simply connect one of the two wires from the switch to one pin of the RST header, and the other wire to the other pin. Which one way around is not important. Just make sure you have a momentary switch, i.e. one that only makes a connection as long as you push it. A switch that can stay in the "on" position may continuously reset the PIC, preventing it from running its program. In this configuration, a short-circuit in the cable to the temperature sensor will only pull the I/O port low. The current is limited to 25mA and the gateway can continue to do its normal job. Only the outside temperature reading will obviously no longer be working. When you become aware of the situation, you can even remotely change the GPIO A setting to None to stop maxing out the I/O port until you have time to investigate the problem.